Norrie Woodhall, the last surviving person to have known Thomas Hardy, asked the New Hardy Players to perform ‘The Mayor of Casterbridge’ because it had never been performed by the original Hardy Players, of which she had been a member. This adaptation by Devina Symes, portrays this tragic tale in a poignant, profound and humorous way; the latter coming mainly from the local Casterbridge characters, whom Hardy loved. Although the story begins in 1832, when a drunken 21 year old Michael Henchard, sells his wife, Susan, and daughter, at a fair; the main story unfolds eighteen years later at the time of uncertain harvests, which immediately preceded the repeal of the Corn Laws. During that interim period, Henchard’s desperate desire to make amends and improve himself is achieved when he is made Mayor of Casterbridge, and his wife and daughter return. 23rd July 2010. Performance at the Lighthouse, Poole on to a sizeable audience. 25th July 2010 By popular demand, and as part of the international Hardy Conference, we performed the playon at the United Church, Dorchester. An international audience enjoyed and appreciated the performance. Sunday 14th August 2011. 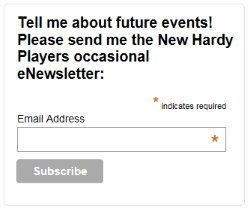 The New Hardy Players were invited by the BBC to perform the wife-selling scene from The Mayor of Casterbridge as an insert into their Countrywise programme. In the programme, John Craven looks at Hardy Country in some detail. The Players involved went to Weyhill fairground near Andover, which is the site Hardy imagined to be Weydon Fair, and probably visited.